In the course of a Bengali meal, the chutney comes after the mains and before the dessert. Mostly served with bhaaja papad (fried papad), the chutney is a palate cleanser as you move from the spices of the main course to the sweetness of the desserts. Obvious, isn’t it, that it will be part of the Poila Boishakh 4-course meal I’ve planned for you on From The Corner Table! For those who came in late, poila boishakh is the first day of the lunar calendar followed by Bengalis worldwide. It’s our second new year. Ain’t we lucky to have two new years? There are various versions of the tomato chaatni – some add to the taste with dates or aam shokto (mango leather), others like to make it a tad bit grander with dry fruits and nuts like golden raisins and cashew nuts. Being a stickler for traditions where certain foods are concerned, I prefer the tomato chutney to remain unadulterated. But there can be no comprises when it comes to making this delish chutney for a poila boishakh meal – hence the dates. This tomato and khejur chaatni is endearingly easy to make. And it gets done in 15 minutes maximum! A preferred medium of cooking this chutney is mustard oil for its pungent taste and smell, but you can replace it with any other vegetable oil. Mastering this dish is as easy as snapping your finger – add this to your repertoire of dishes and whip it out as an accompaniment to Indian breads, a pilaf or with rice and lentil soup. 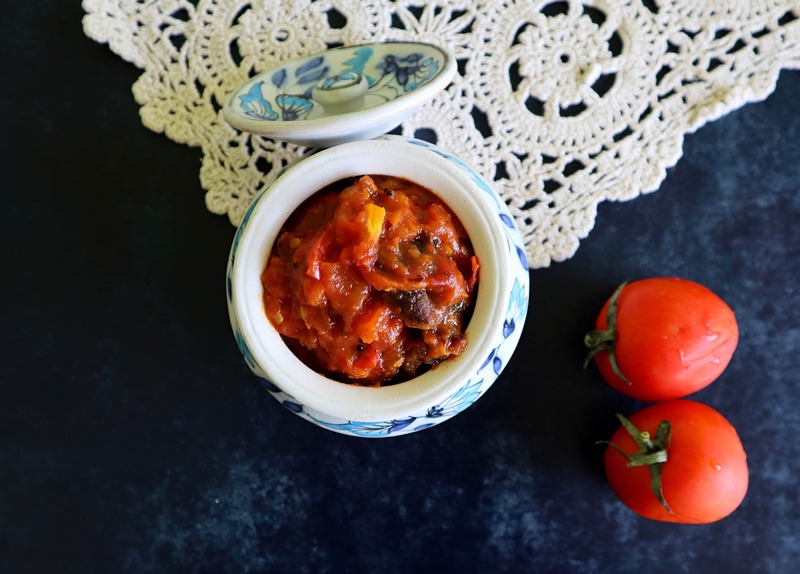 This Bengali-style tomato and dates chutney is versatile and how! If you happen to use this recipe to make the chutney, do share your experience. You can connect with me via email cornertabletales@gmail.com Facebook (click here), Instagram (click here) and Pinterest (click here). Watch out for the Poila Boishakh 4-course meal’s last recipe on April 15. If you haven’t yet, then subscribe to the newsletter to receive the latest post From The Corner Table in your inbox. Until next time, happy cooking and eating! Tangy tomatoes and sweet dates cooked together to make a delicious side dish. In a wok or kadhai, heat mustard oil on a low flame. Add the cumin seeds, mustard seeds and dried red chilli to the hot oil. When the seeds start to pop, add the chopped tomatoes. Stir well to coat the chopped tomatoes in the spiced oil, cover and cook for 5 minutes. Mix in the grated ginger and seedless dates. Sprinkle turmeric powder, salt and mix. Cook on low flame – this will allow the tomatoes to cook in their own juice and you won’t need to add water. Using the edge of your cooking ladle, roughly mash the tomatoes and dates. Cover and cook for another 5-7 minutes or until the tomatoes and dates are cooked well. The chutney should be thick and have a glaze. Stir frequently. Add the lemon juice. Stir and check the seasonings. Remove from heat. Serve cool, after the main and before the dessert.